The stained glass window commemorates King George V.
George was born at Marlborough House, London, on 3rd June 1865. He succeeded as King of Great Britain and its Dominions, and Emperor of India, on 6th May, 1910, aged 44 years. He was the eldest surviving son of Edward VII. He married on 6th July 1893, aged 28, Princess May of Teck, daughter of Francis, Duke of Teck, aged 26 years. (She died in 1953.) King George V died at Sandringham on 20th January 1936, aged 70, after a reign of twenty-five years. 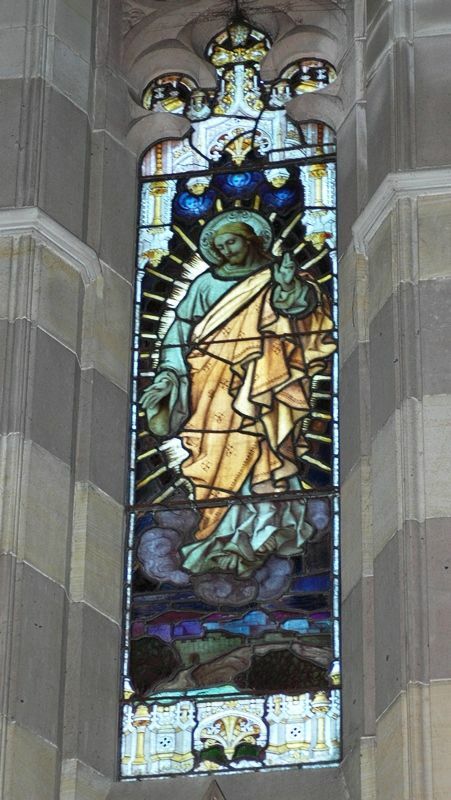 At the time of the new King's accession, the parishioners of St. John's Church erected a stained-glass window in the sanctuary. Its subject is 'The Ascension'. There is no inscription.